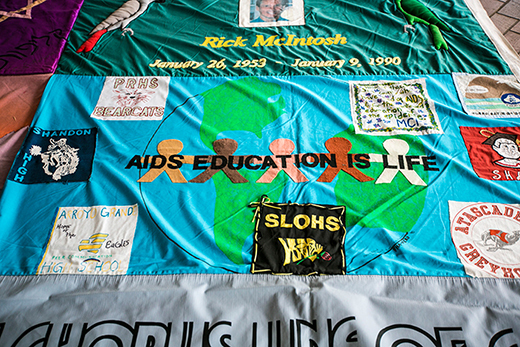 On World AIDS Day, Dec. 1, Emory hosts the nation’s largest collegiate display of the AIDS Memorial Quilt, along with a series of campus events intended to build awareness of HIV/AIDS. In recognition of World AIDS Day, Emory will host the annual Quilt on the Quad commemoration — the nation's largest collegiate display of panels from the AIDS Memorial Quilt. On Thursday, Dec. 1, colorful panels containing names of those who’ve died from AIDS-related causes will carpet the Emory Quadrangle to help bring awareness to the scope and personal impact of the AIDS pandemic, says Jon Giuliano, an Emory junior who is president of this year’s Quilt on the Quad organizing group. In case of rain, the quilt will be displayed on the terraces of the Dobbs University Center (DUC). Given the pioneering work on HIV/AIDS being done at Emory’s Center for AIDS Research, the Emory Vaccine Center, Yerkes National Primate Research Center and Rollins School of Public Health — including President Claire E. Sterk’s own background in public health — it’s especially fitting that the university host the quilt display, Giuliano says. “With the development of life-extending medicines, a lot of people think of HIV/AIDS as something that exists in the past,” notes Giuliano, a neuroscience major with an interest in attending medical school. “But for many in the United States and the developing world, this remains a very real problem — one that we can still work to solve,” he says. This marks the 12th year for the Quilt on the Quad event, which will display some 800 panels, each memorializing the names of individuals who lost their lives to AIDS. A community-partner fair will be held from noon to 2 p.m. on the DUC Terraces, which will include musical performances. At 1 p.m., Emory students will read names of those lost to AIDS. The U.S. Centers for Disease Control and Prevention estimates that 1.2 million people in the United States are living with HIV, with roughly 50,000 new infections per year. Of those who are HIV positive, almost 1 in 8 or 12.8 percent do not know their status. According to the World Health Organization, an estimated 36.9 million people are living with HIV/AIDS worldwide. To increase awareness about World AIDS Day, sections of the memorial quilt have already been appearing in buildings and public venues throughout campus, Giuliano says. “The quilt blocks have been made by the families who’ve lost loved ones, and we know they’ll often travel long distances to see it,” he says. The NAMES Project AIDS Memorial Quilt was founded in 1987 in San Francisco by a group of people afraid that the names of friends and loved ones lost in the early days of the pandemic would be forgotten. Their goal was to create an ongoing memorial for those who had died of AIDS and to help people understand the devastating scope and impact of the disease. Today, the NAMES Project Foundation is headquartered in Atlanta and remains the international caretaker of the AIDS Memorial Quilt, which now comprises nearly 49,000 panels representing the names of more than 96,000 individuals. New panels continue to be accepted and more than 1,000 displays continue to be orchestrated across the nation every year, transforming sobering statistics into a visible reality.